We are forever standing on the Foxtrot Bed and Breakfast deck in Gatlinburg and looking for the observation tower on the top of Clingman’s Dome in the Great Smoky Mountain National Park. Don’t get me wrong; it’s a great view. I could look at it all day. But, today, we reversed the perspective. 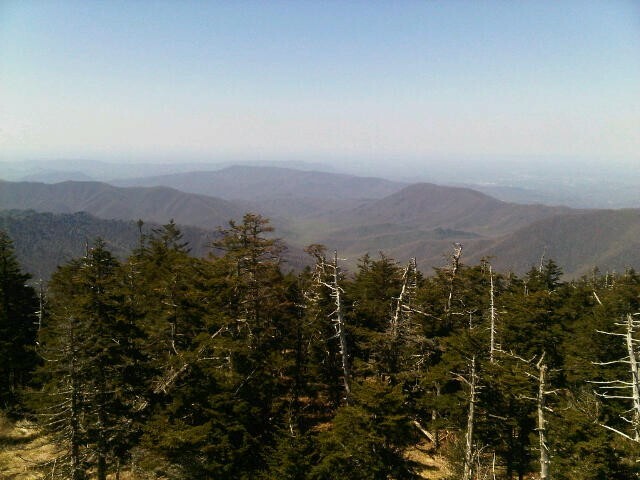 We walked the steep, half mile, oxygen-deprived trail to the top of Clingman’s Dome and the observation tower. All the way up, everyone is gasping for breath even if they don’t have asthma. On the way down, you lean so far back to balance your steps that you feel like a cartoon character. From the top, with the naked eye, you could see Ober Gatlinburg, and the condos close to the ski resort. Adding the magnification of binoculars, the house was just barely visible. It’s great to look at things from a different perspective wither it’s a view, a person, or a problem. Things are often clearer when you change your viewpoint.